Featuring a score from ex-GTA veterans. As I make my way through Lost Ember's opening forest section, I can't help but admire how polished it looks. Off the back of a recently successful Kickstarter campaign, I'm playing a pre-alpha build which, besides one brief teaser trailer released earlier this year, is my first taste of Mooneye Studios' self-proclaimed "first big project"—a stylish adventure game where you assume the role of a roving wolf who harnesses the power of possession. Awakened by a curious glowing red orb, my quest begins as I follow its trail, swirling and swooping into a cavern in front. Knife-edge chasms line the way as I wade through clusters of long grass and rows of blue flowers. I emerge at the other end, the sun blankets the pastoral landscape ahead in a striking yellow hue, and a booming string score overpowers the rush of a nearby waterfall and chirping birds. I burst into a sprint and the energetic melody picks up pace. Not only does Lost Ember look great, it sounds wonderful. Thought to be extinct for more than a century, wolves returned to Germany during the 1990s, which is where Lost Ember's story stems from. 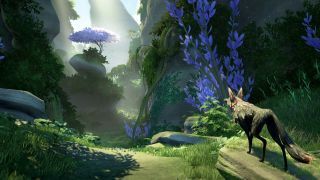 According to Mooneye CEO and lead programmer Tobias Graff, the wolf represents majesty and agility, and its ties to myth, religion and legend—coupled with the idea of nature returning to human worlds—are reflected in the game's story. The aforementioned red orb symbolises the last remnants of an ill-fated Incan and Mayan-inspired civilisation that fell to ruin, and while you're not told the whole story up front, following your companion to the old Machaquila capital helps uncover he and his people's tale. "On the way, he can show you his memories and in these memories you get to know your companion and what role he played in this old civilisation," says Graff. "You get to know that, what happened, why he did the things that he did, and you slowly begin to learn what your role in this may be." The demo segment I tackle lasts 20 minutes or so, however Lost Ember's main quest will hit the five hour mark, with optional areas which tack on another couple of hours. Inspired by the Zelda series, Journey and, more recently, Abzu, Lost Ember is primarily about exploration, and while it doesn't have puzzles in the most obvious sense of the approach, the game's central mechanic allows the wolf to temporarily possess other creatures in order to further its crusade. Each animal has its own skills and special abilities, which sees me burrowing beneath fallen trees and path-blocking boulders as a mole, and soaring above ravines as a songbird—sinking and skyrocketing at will. A quick button tap restores my wolf form and I trot on as before. Müller suggests that while new iterations of big budget games often introduce fresh mechanics to preexisting ideas, Lost Ember is designed to be a more simplified, and in many ways more refined, experience. Graff admits a combat system in some shape or form was considered initially, but paring mechanics back one-by-one made the team realise anything on top of possession was superfluous. At present, these set pieces have a proof-of-concept feel to them, but there's definitely scope for more involved, more intuitive puzzle work down the line. What's more the pacing between creature-possession segments is handled well, which is something I hope carries over to Lost Ember's final incarnation. Mooneye hopes to include ten different creatures come full release—"we have different birds and different fish, but we count that as one animal or creature"—which is a number subject to change against the game's final crowdfunding total. Lost Ember has, at the time of writing, accumulated more than three times its original ask on Kickstarter. Its scope is unlikely to change, though, with Mooneye instead focused on improving what's already showing a distinct degree of promise. "With the initial goal, we still needed money from external sources—maybe the indie fund or external publishers or whatever—but now that we have that and can work on it independently to create more animations, invest more into testing and bug fixing and stuff like that," says Graff. "We can then set of focus on polishing the whole thing before we think of adding lots of new features." Lost Ember has also already accrued a number of pre-release accolades—including a runners up award in the Best Newcomer category of this year's German Videogame Awards. This netted Mooneye €25,000, which in turn gave it the means to develop its debut project full time. The project has even attracted the talents of Rockstar veterans Craig Conner and Will Morton to handle audio duties. With release planned in early 2018 there's still much for Lost Ember to do, but it can only get better assuming it continues down the path it's so gracefully crafted so far.